Salve amici nuovi! Chee-ow pie-zans! Let me preface my qualifications (or lack thereof) for writing this new and hopefully entertaining blog about life in the in-between. Now, I am not a scholar of language or literature, philosophy or sociology. I am not a passionate activist for any particular cause, or a politically informed lobbyist. I cannot offer many learned quotations from famous authors, philosophers or world leaders in order to exemplify my humble points of view. In fact I write this in between filling prescriptions and counseling patients. I probably should write about maladies and medicine but Italianita’ is so much more fun. This is already my third installment as a blogger on this wonderful website. So, I searched long and hard for an explicit, entertaining anecdote to familiarize you all as to what I actually mean by the term “Mezza Via”, that is if it still remains unclear after reading my first two articles. One of my earliest memories of our family being different, not only from the German, Polish, and Irish-American families that lived on our block, but from the Italian-American families as well, was simply the car we drove. I remember exactly what it looked like, where the scratches were, the feel and scent of the interior, and even the noise it made when it turned left. My baby brother and I were crammed into the backseat, becoming slightly more nauseous with every shift of the stick and press of the clutch. That Fiat Seicento was the only one of its kind on my block. I’d venture to say it was the only one in the whole neighborhood, probably all of Queens. It was a small little thing; two men could lift it, dull white with red interior. I remember my father fixing it a lot on the weekends. It was an adventurous piece of machinery; as I remember we were turned away at the Whitestone Bridge one day because of the wind! Just us and our Seicento, everyone else, Italo-American and non Italo-American was allowed to cross with their substantially heavier cars. My mother even got a speeding ticket while on the expressway (I just think the police officer wanted to get a closer look at the car). My parents told me that we drive this car because it “comes from Italy, like Daddy”. 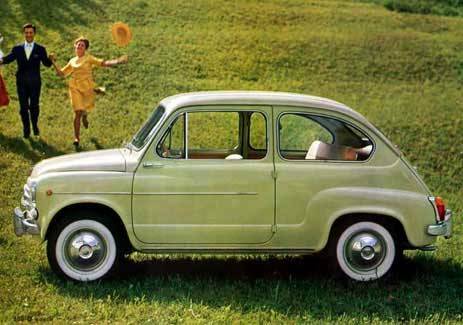 So I can safely say that no one else’s Daddy could have come from Italy, because no one else drove this car. They were Italian, they said they were. Their last names ended in vowels, but their parents drove much bigger, shinier cars. So here was my first taste, at such a young age, of finding myself “mezza via”, halfway in-between. I was riding in a car that no Italian-American (notice the hyphen) kid’s family would ever drive or own. The problem was I was not speeding down an autostrada, peeling through the tangenziale, or pulling into the “AutoGrill” for a lungo on the road. I was instead, getting dropped off at softball practice with the other first grade Polish-American, Irish-American, Italian-American and German-American kids while the mothers went home to cook dinner for a 5pm serving. We never ate dinner until eight o’clock at night. I was the luckiest first grader because I had the latest bedtime (but that’s another blog). Where did I belong? This car and this family of mine seemed displaced. I had to keep searching. Sono qui a mezza via in quelche e la corsa mia. Our car looked just like this when we got it (but the people in this ad do not resemble my parents); it lasted some years and we have many more memories surrounding it. Imagine seeing the new version zipping around New York!! I’m in!